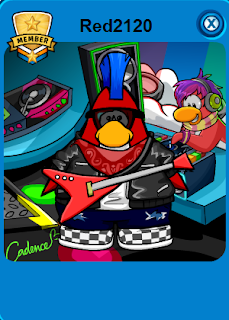 DJ Cadence is the most hyper penguin out of all the Club Penguin characters! She Loves playing games, and mixing beats. 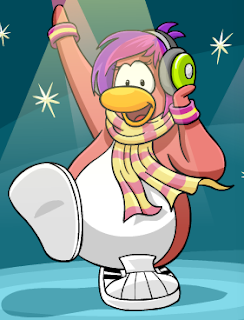 She is officially Club Penguins best DJ. 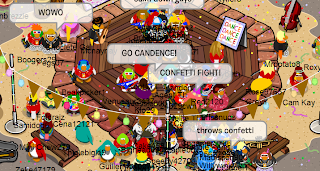 She is seen in The Dance Contest and often shows up at special events. 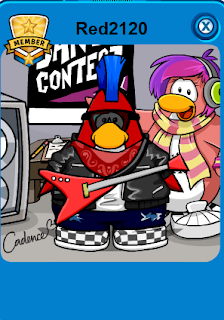 For example, She showed up to the music jam and she also showed up to the Club Penguin play awards. She is in love with the night club and she loves to dance! She logs in at 3-5 servers! A Good place to look is the Night Club; She is always crowded. Another way to find her is to look at the users in the room. Too bad shes not on servers that long, shes only on servers for about 4 min. 4. She does NOT have a igloo. She lives in the Night Club. 5.She does NOT have post cards. Although you can get a special background from Her! She has 2. I farted I farted I farted I farted I farted I farted I farted I farted AND I...FARTED!